We’ll help you make sure that your holiday is memorable for all the right reasons. You’re really excited about your forthcoming luxury holiday and the last thing you want is for some minor hiccup to put a spanner in the works. Our travel tips for luxury travellers may seem like common sense but it’s so easy to forget the obvious and spoil your holiday; so we thought we’d share our checklist for travel planning with you. 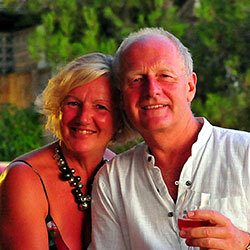 A little bit of input from you at home will reap huge rewards when you arrive abroad. Whilst we’re also fans of ‘last minute’ travel to respond to a whim or a period of poor weather at home, more often than not we think way ahead for more significant travel arrangements. You can usually find flights, accommodation and availability of locations at most times of year but if you really want the pick of the best hotels, rooms in the hotels, best access to attractions or facilities and the choice of flight times and dates then you need to think ahead – way ahead. In our experience nine months to one year ahead generally gives you the luxury of choice and means that you can select pole position for any trip you are planning. Why compromise on a trip that will probably cost you the same whether you’re booking late or booking in time to select exactly what you want from it? 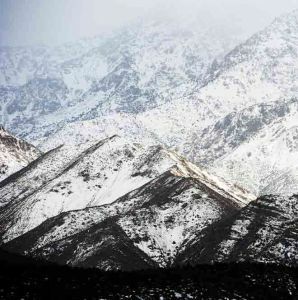 ‘We want to see the Himalayas’ was a recent inquiry of us, with no indication of whether strapping on crampons for an assent to Everest base camp, or sitting on the veranda of a Simla luxury hotel sipping a Chota Peg whilst looking at the huge snow-capped range was preferred, which means that ‘rubbish in-rubbish out’ (to use an old computer line) to your adviser will waste endless time and can also result in disappointment if you haven’t thought it through. Whilst many might abdicate their travel plans to a trusted Tour Operator or agent, there’s never a substitute for doing a little research yourself. 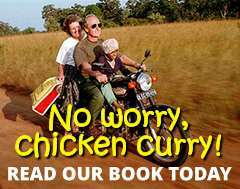 So much information is freely available on the internet that a couple of hours will enable you to trawl through a huge amount of advice on what to see, when to see it, how to travel, what to avoid. Ask yourself what it is about a country you’re visiting that you especially want to see/experience. 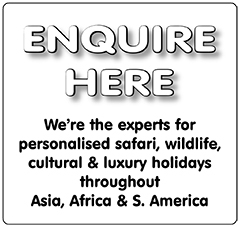 Is it culture, history, wildlife, scenery, people etc. Once you’ve got a wish list together then research on these terms and draw together a shortlist of ‘must haves’ for your journey that you can either build on yourself or use as a brief for your adviser. We once arranged to play golf in Sri Lanka but the Tour Operator hadn’t factored in just how long a game of golf can take – so we arrived late and failed to finish the round before nightfall – all very frustrating due to a lack of communication; whereas a little juggling of the itinerary beforehand would have solved the issue. High Season/Low Season is usually a good indicator of the best time to see things closely linked with the price range – but it’s not infallible. Assuming you’re flexible in your own travel dates then consider what are the best conditions for viewing what you want to see eg. 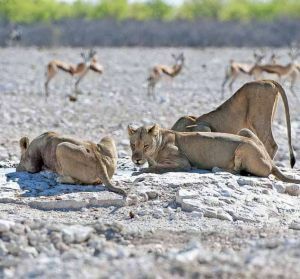 If you’re after wildlife you may have to compromise by enduring high temperatures in Africa and India because far fewer waterholes attract the majority of the wildlife (and cover is much more Spartan), whereas ample water at other times of year mean lush grasses (more extensive cover) and widely dispersed wildlife who can find water in numerous places. Events and festivals that happen at specific times of year may well influence your date of travel as they can make a significant difference to the spectacle and your enjoyment of a country. Climate generally may well play a large part in your date selection, for any other pursuit other than wildlife, as it’s down to what you can endure, or feel comfortable with. You’ve now got your rough itinerary. Don’t just accept it as set in stone but read it through as if you’re actually there on the ground enjoying it. Start by checking your travel plans to and from home and the port of departure at either end – have you allowed enough time, what time do you need to check-in before departure, what is the timing of your carrier schedule, what time do you arrive at your destination etc. Do you prefer night/day flights; do you mind getting up at the crack of dawn (or before) just to make a travel connection or would rescheduling travel plans fit better with your equilibrium and the arrival time at destination? Are you happy with all of this? 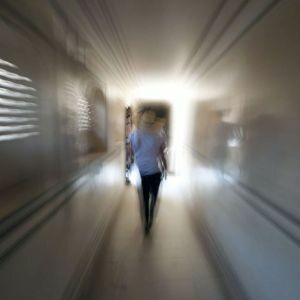 Walk your way through the itinerary considering all aspects (such as the golf game mentioned above), the travelling time between locations or destinations, how much time you’re ‘in transit’ as opposed to actually enjoying the places you’re going to. Is the journey part of the fun, or is it an element to be endured until you can put your feet up? Insurance. Friends of ours incurred huge medical costs after being run over in New York, because they’d ticked the ‘Europe’ box, not ‘USA’ on their insurance application. One would have hoped their trusty advisor would have noticed this – but unfortunately not. Check that your insurance is not only current but relevant eg. many travel insurance companies cover skiing but unless you’ve got it with you and are definitely ‘on piste’ then your chances of being airlifted off a slope are minimal without a credit card. The best way is to buy insurance with the ski-pass (which is cheap), so there is no debate at the time you need help most. There’s little point in having insurance unless its relevant but its easily overlooked; especially if you have an annual insurance as the tendency to check for relevance diminishes with time! Passports. Countries are increasingly asking for the currency of your passport to extend at least six months beyond your date of travel. If you allow nine months to be safe (from your travel dates, not from when you think to check some months beforehand) then it greatly reduces the longevity of your passport. On top of this many countries expect that you should have at least six empty pages in your passport. 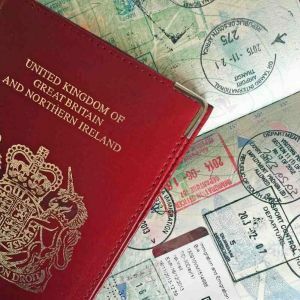 Bear in mind that one stamp on a page doesn’t count as a clear page and that if your trip covers several countries, you may not have six clear pages by the time you have accumulated all of your visas and arrive at the last. Visas. These are generally straightforward to obtain and even Russia and India are gradually streamlining their processes. Nevertheless, Russian visa authorities require sight of an invitation from the places you’re staying at, photocopies of every visa in your passport and the dates you travelled to all other countries (which can be a real pain) unless you take an organised tour in which case ‘visa vouchers’ are available at port of entry as long as you stay with your guide. Independent travel is not openly encouraged. Indian visas are now much simpler to obtain online but you need to be careful of procedure and in particular the sizing of passport photographs which are totally different from standard protocols. Many elect to employ an agent to obtain visas but again there’s no substitute for overseeing it yourself. Not only will you pay up to double the cost of the visa through an agent but it’s not an infallible solution – as a fellow traveller found when he attempted to enter India, because he had the ‘wrong type of visa’. It’s not difficult but it does require concentration and patience. Fortunately many countries now have reciprocal arrangements with our own and/or will issue visas at port of entry. The secret is – check first. 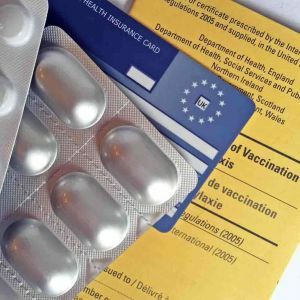 We had to have ‘Yellow Fever’ jabs for Botswana, even though we weren’t coming from a Yellow Fever risk area, nor going to a country (including Botswana) that had it. Not only was it a potential health risk to take it but on arrival no one checked that we had it! Check that the jabs you had a few years ago are still current. Check that you don’t need additional jabs for the places you’ll visit. Check on presence of malaria and don’t take risks. Whilst some malaria meds can give side effects, Malorone (or its equivalent now that the name is out of patent and can be purchased much more cheaply) is probably the best solution and any side effects are short-term, compared with the debilitating and often enduring effects of malaria itself. Make sure you take the meds sufficiently ahead of time (according to suppliers’ recommendations) prior to travel. Check out the presence or appearance of possible health threats at your destination(s) so that you are forewarned eg. AIDS throughout much of Africa. Check your government advisory notes for travel prior to departing. We try to pack for all eventualities by using multi-purpose clothing eg. lightweight padded waterproof jackets, but still manage to get it wrong from time to time as a tropical day becomes a chilly night or an autumnal week turns into a heatwave. It’s not always possible therefore to get it spot on but if you’ve done your homework on climate for the time you’re travelling then all should be well. It’s good to consider clothing as you walk yourself through your itinerary; allowing for evenings and daytimes, travel on boats or over water, open vehicles or enclosed cabins, protection from the sun or insects etc. Within any limitations of your luggage allowance you should be able to cover all bases! Cherrie’s sister was ‘bumped’ from Business Class because of overbooking by the airline. Although she was compensated it was no substitute for being cramped in coach for eleven hours. It’s important therefore to check-in from home and arrive at a good time ahead of the crowds – irrespective of what cabin you’re going into and despite what the airlines profess. Check what advanced online information is required by your carrier (airline or ship) in terms of passport information, visa details, etc. make sure you provide it in a timely manner. If there is an opportunity to secure the seating you prefer then make sure you check in at the appropriate time prior to leaving home. 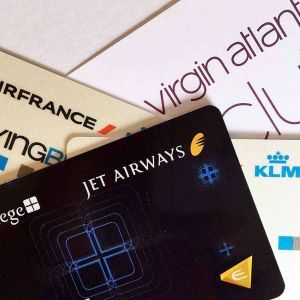 Print out Boarding Passes – even though ours are often ignored when we arrive at check-in, they do nevertheless get us through the scrum sometimes found as gates open. If possible, obtain enough local currency for a day or two at your destination. It’s usually available at the port of arrival but often not in more remote places. 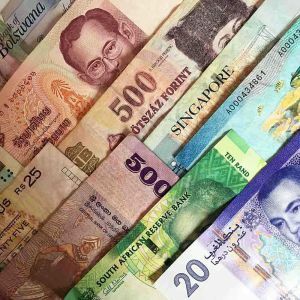 When you arrive at a destination is not always the best time to be queuing for currency exchange, especially if it’s been a long and tiring flight, or you’ve arrived when most of the airport is closed. It’s useful for tips and local purchases where you arrive ‘out of hours’ or where credit cards may not be accepted. 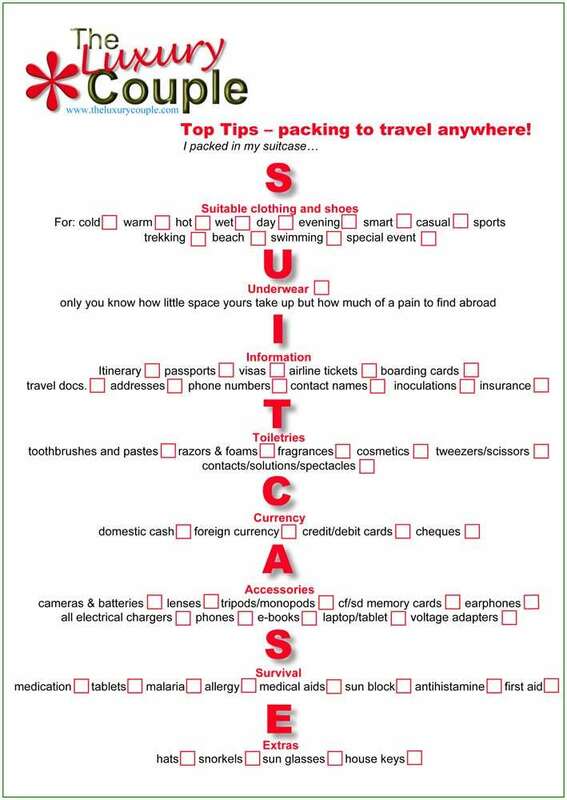 We’ve already covered this before and you can see our easy to print and follow ‘SUITCASE’ suggestion here. It’s good to get into a routine with this and you can modify it to suit from place to place – but at least it gives you an aide memoire instead of starting from scratch each time and running the risk of forgetting something. 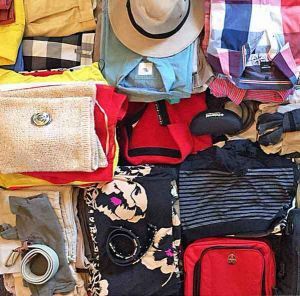 Open up and print out the Suitcase checklist document (PDF format, requires Adobe Acrobat Reader) that you can use as a guide as you pack.